In 1973, Shosseynaya Airport became what we know today as Pulkovo International Airport, which after its latest renovation in 2015, was extended with two new passenger terminals and the Pulkovo 3 executive terminal. This new project was created using the compact mineral from PORCELANOSA Group, KRION®, in its high transit areas. Pulkovo Airport serves the city of Saint Petersburg, and is one of the four busiest passenger airports in Russia. The regeneration of KRION®, thanks to being fully homogenised, easy to clean, vandalism-proof, and perfect for high transit areas, makes it ideal for the transport industry. 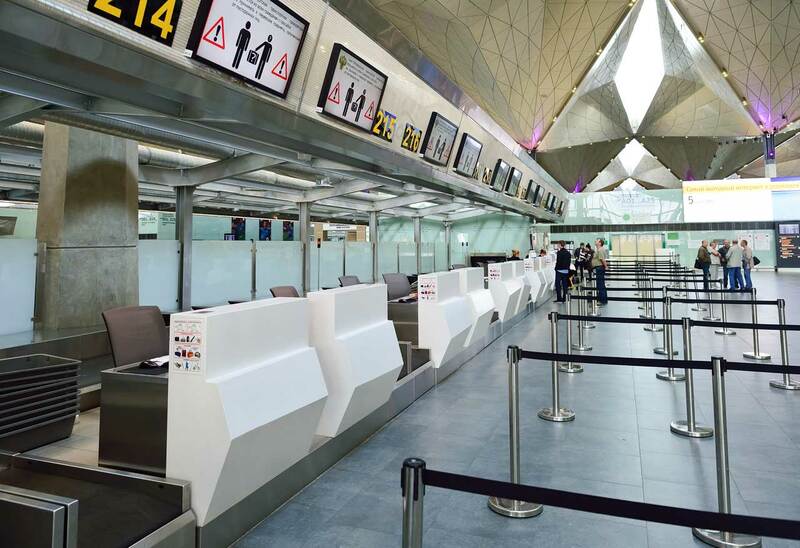 In this project we can find KRION® in various applications: the check-in desks, boarding desks, bathrooms, Business area counter, Business lounge catering area, information areas, accesses for individuals with reduced mobility, and signage. In addition to our star colour, KRION® 1100 Snow White, the most popular, we can find other colours such as 1603 Nordic Blue, 1901 Black, and 9901 Cristal Black+. Because a conventional solid surface is not sufficient in a large, high transit space, KRION® is the solution.